Christmas is just TWO days away! wow! and that means the year is nearing to its end too. wow! another year. time indeed flies. i can still vividly remember last Christmas and now one year has passed. Christmas sends a simple yet significant message that is still not known to many i believe. it's not about Santa (i dont know where that white-beard guy came from anyway), neither is it bout gifts nor parties. it all about a simple story with profound message. it's about JESUS CHRIST. 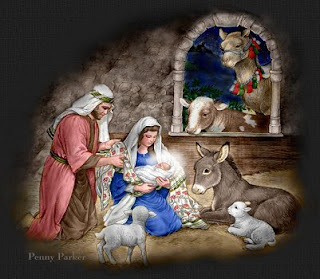 this was the day that He was born and sent down to earth for both you and me, a day of rejoice. this little baby born in a manger was sent to earth for a mission - to die for the sins of you and me that we would be reconciled with God. without this baby boy we're heading hell.